Multi-engine, piston aircraft were very much in style back in the 1970s and 1980s. Those were the days of $1.50/gallon avgas. At the time Piper, Cessna and Beech collectively had thirteen twin-engine models in production in the late '70s. Today, Piper builds two, Beech offers one and Cessna has abandoned all twin engine, piston construction. There are several reasons for the cutbacks, but the primary one is simply economics. Twins no longer make sense when avgas can cost $6/gallon and maintenance at any good shop will set you back $100/hr. Never mind how much is too much. 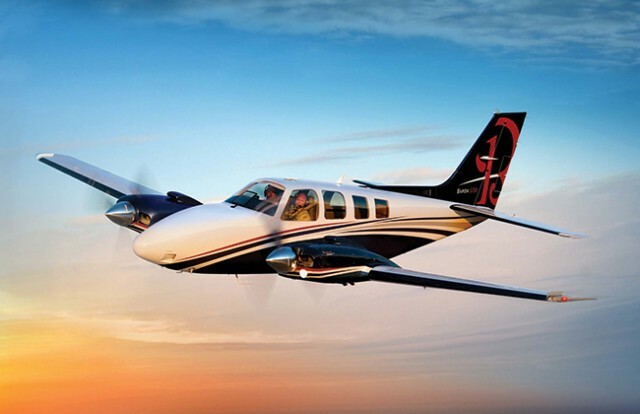 Additionally, even pilots with the means to buy and operate a twin are beginning to challenge the safety records of multi-engine piston airplanes over singles. The sad clich in the industry is that the only real use for the second engine if the other one quits is to transport you directly to the site of your accident. This isn't a knock against twins, . There's no question that pilots who operate over water or above mountains can benefit from the second engine. There's also no question that a multi-engine aircraft, properly flown following an engine failure, can save your life. Here's a look at the remaining half-dozen piston twin on the 2015/2016 market. All prices are for 2015 models. Piper Seminole—PA-44: The Seminole was born at a time when several companies were offering new, four-seat, twin trainers. In the late 70s, Beech introduced the Duchess, Grumman American premiered the Cougar and Piper unveiled the Seminole. At the time, there was talk of a pilot shortage, and the three twin trainers were designed specifically to meet that need and provide an economical flying classroom to teach the next generation of airline pilots. Only the Seminole survived. With its tall, T-tail and seemingly indestructible Lycoming O-360 engines, the PA-44 has remained in production, admittedly intermittently, for 36 years. 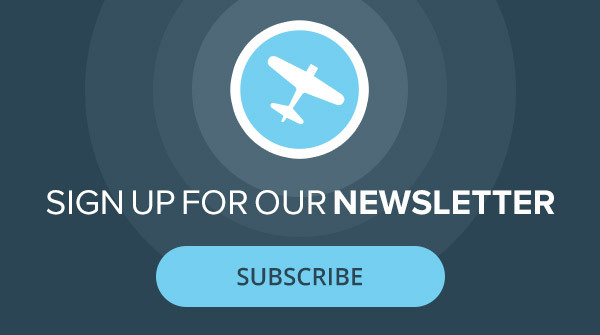 The airplane has become a favorite with institutional flight schools but also occasionally sells to individuals and business flyers who enjoy the redundancy of two engines and can live with a 150-160 knot cruise. For a twin, the Seminole is a relative lightweight at 3,800 pounds gross weight, and its counter-rotating propellers help tame the dreaded Vmc problem. Single-engine climb at gross is an relatively anemic 212 fpm, but in fairness, that's not much worse than the other twins in the class Still, this trainer is marginal in Albuquerque during summer. Barring such eventualities, the 110 gallon fuel supply allows a range of 700 nm for those looking to travel, and the airplane is as comfortable in traveling mode as it is for flight training. Piper Seneca V—PA-34-220T: The Seneca is a very different type airplane than the Seminole. Though it can be used for multi-engine instruction, the Seneca V's turbochargers are understandably intolerant of inflight shutdowns and restarts. Today's Seneca V is more of a luxurious traveling machine. I spent three years and 700 hours with a Seneca II company airplane, and it performed every mission I could think of better than I had any right to expect. Most of the time, my flights were medium to long distance business travel, in one case an editorial, round robin from Los Angeles to Key West to Calgary, Canada, and back to Los Angeles. The pair of 200 hp, Continental TSIO-360 engines were turbocharged, so I never feared high-altitude airports (the airplane accepted several operations at Leadville, Colorado, elevation 9,927 feet MSL, without complaint), and the 123-gallon fuel capacity allowed easy four-hour hops plus reserve, worth 700 nm between pit stops. Long range power settings could stretch that to well over 800 nm. As you might expect, the modern Seneca V does everything better. Horsepower is up to 220, the avionics suite is the Garmin 1000 and the level of refinement is excellent. Cruise in the flight levels is better than 180 knots, and interior room is better than a Baron, more reminiscent of a Navajo's cabin than a light twin's. At 48 inches across, the Seneca V's elbow room is equal or superior to that of any other piston twin. Diamond DA-42-VI Twin Star: Of the remaining international twins, Diamond's entry couldn't be any more individual. The Diamond Twin Star looks like something Luke Skywalker might pilot, it flies behind a pair of FADEC-controlled Austro diesel engines, sports dramatically upturned winglets on the tips and generally manifests a modern-as-tomorrow demeanor. Today, the company's Austro AE-300 turbo-diesels power the DA-42 with 168 hp per side and a 1500 hour TBO. 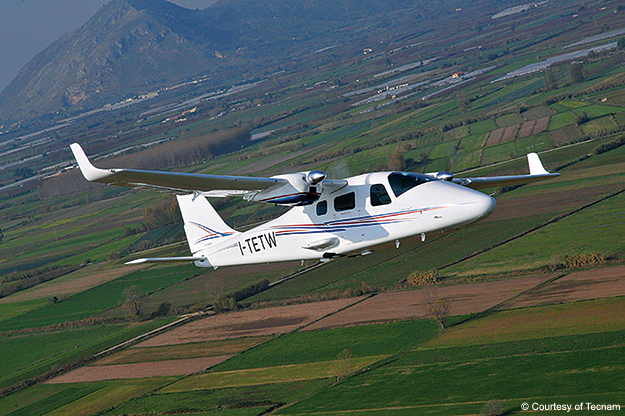 In combination with a 44 foot span, high aspect ratio wing, this provides the standard DA-42-VI with a sea level climb of 1800 fpm and a max cruise of 197 knots. Fuel burn is only 10.4 gph total, so the 74 gallon long range tanks allow the Twin Star to cover 795 nm between fuel stops. Beech G58 Baron: Teledyne Beechcraft's lordly Baron is quite literally the top of the multi-engine class. It's not only the most expensive production, piston twin on the market; it's also the best performing and, arguably, the most agile handling of the group. Over the years, I've had the pleasure of delivering a half-dozen of the type across one or another ocean, and the trips have always been a pleasure. There were once three Barons, but today, the 2015 G58 represents the most polished and sophisticated Baron ever offered. Beech products have always been blessed with a build-quality and control harmony that few other models can match, and the newest Baron exemplifies the best. 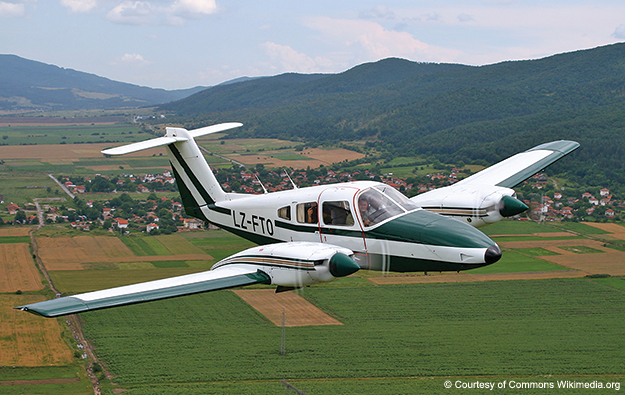 With an inevitable pair of 300 hp, Continental IO-550s on the wings, the Baron climbs at a maximum 1,730 fpm. Go to the whip at 7500-8500 feet and the G58 will manage 200 knots on about 36 gph. That provides 4.5 hours endurance for a range approaching 1,000 nm. One slight problem is that the G58 has a fairly heavy empty weight. The result is a full fuel payload of only 330 pounds. That's roughly two folks in the six, ultra-comfortable seats. If you need to fly two hours at max cruise, you can leave 65 gallons in the truck and still have payload for four folks plus baggage and a range of a least 600 nm. Barons invariably endear themselves to all who fly them. There may be better airplanes available in some respects (there are certainly less expensive ones), but don't ask a Baron owner to name one. Tecnam P2006T: About eight years ago, Tecnam, the well-established, Italian LSA manufacturer, hit upon the novel idea of mounting a pair of 100hp Rotax engines on the wings of a miniature Aero Commander look-alike, and offering what has to be the world's least expensive, multi-engine trainer. I flew the first, P2006T delivered to the U.S. at Oshkosh in 2009, and any tendency to laugh at the concept was immediately dispelled. Designer Luigi Pascale (designer of the P68 series Partenavia twins) elected to fold the wheels into pylons on the bottom center of the fuselage, mounted fully featherable props on the Rotax 912S, geared, liquid-cooled engines and wound up with a viable, four-seat twin with remarkably inexpensive operating costs. With both engines turning, the 2006T delivers 1,140 fpm climb. Shutting down power on one side reduces that to 212 fpm, and single engine service ceiling is 7000 feet. Cruise on both Rotax 912Ss is 140 knots, so the airplane's 54 gallons are good for about 4.5 hours plus reserve. ...All of which may be academic if your mission is primarily training. Today, the Partenavia has been revived as the Vulcanair. Again, there are a myriad of models available, all based on the original Partenavias. Vulcanair has added an unpressurized turboprop model and a retractable to the mix, the P68Vr. 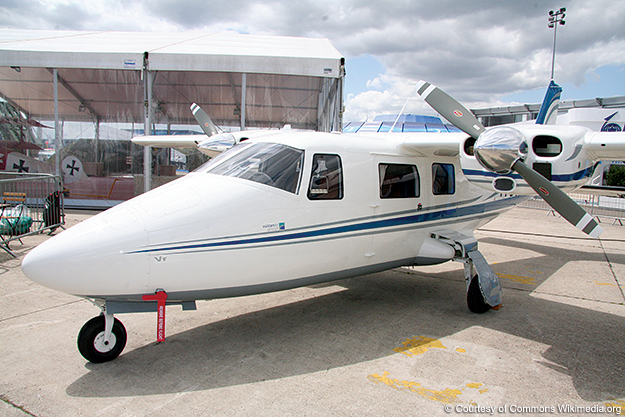 Like the Tecnam P2006T, the Vulcanair retracts its wheels into a short pylon beneath the cabin. As in the 1980s, the Vulcanair P68 flies with perhaps Lycoming's most durable engines on the wings, the ubiquitous, 200 hp IO-360-A1B6, rated for 2000 hours TBO. The retractable version is quite a bit quicker than the original fixed-gear model, 168 knots at 8000 feet. Service ceiling on both engines is listed at 20,000 feet; shut down one engine, and that's reduced to 5000 feet.